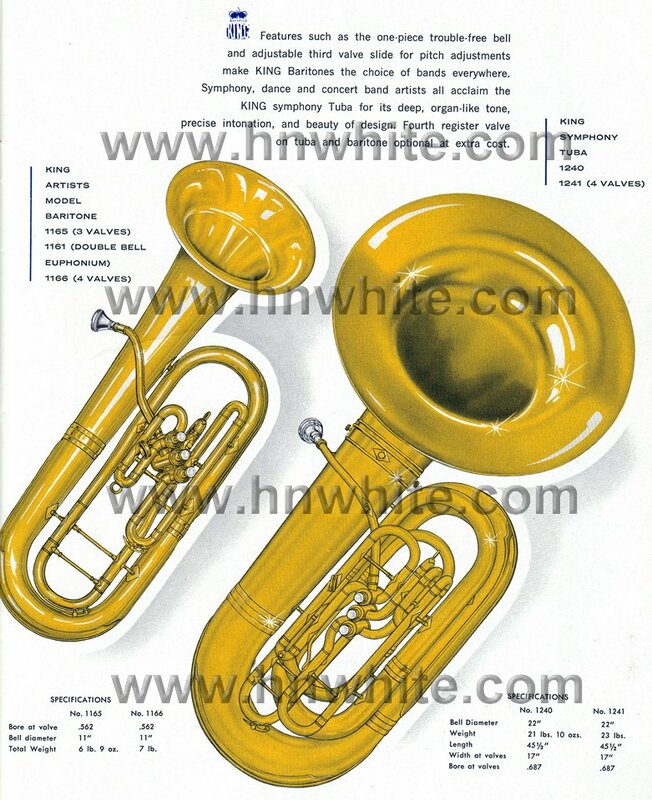 From The H. N. White's Company's earliest days, they made the finest low brass instruments on the market and led the way in innovation and quality. 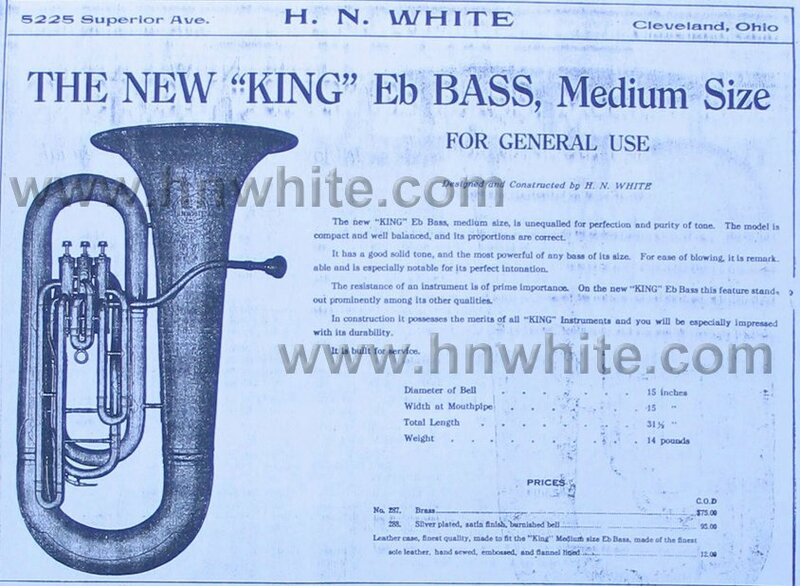 The H. N. White Company made the following brands: King, American Standard, and Cleveland basses. 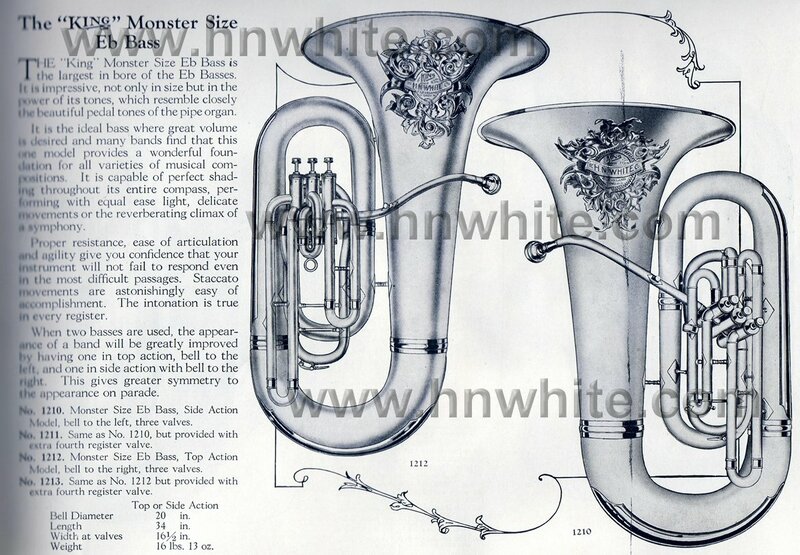 The H. N. White Company made all of its own Silver Basses and did not stencil any for other companies (that I know of). 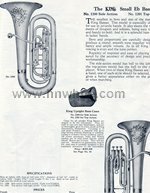 This page is designed to show the first known year of production (based on my catalogs) and any changes that are made over the production cycle of the instruments including model numbers and any unique specifications. 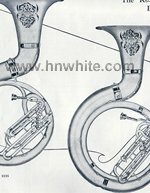 Please note all the "www.hnwhite.com" watermarks on the catalog pages, sellers from www.ebay.com have used information inaccurately and without permission from this website and it is essential that buyers know the source of information. Sellers may use watermarked catalog pages, please do not edit out the website address. This website strives to provide the best information possible. 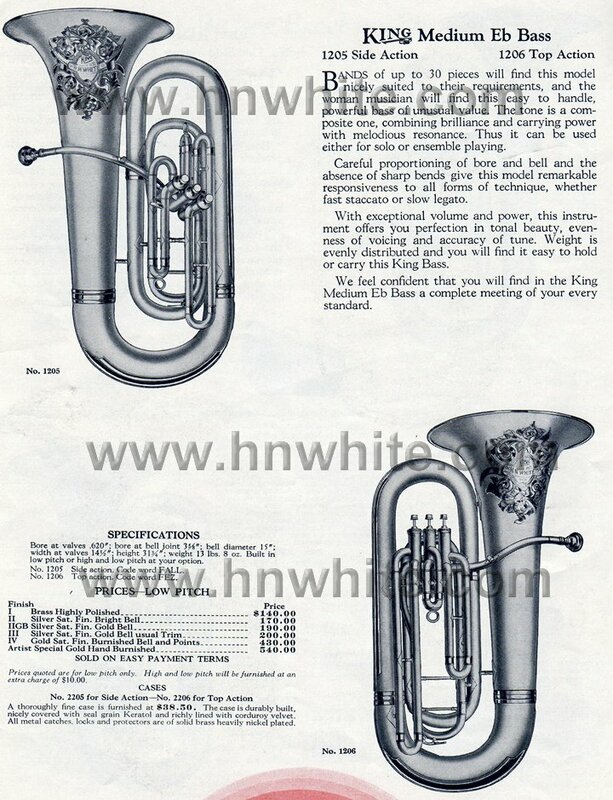 King Eb: #320...Brass highly polished. 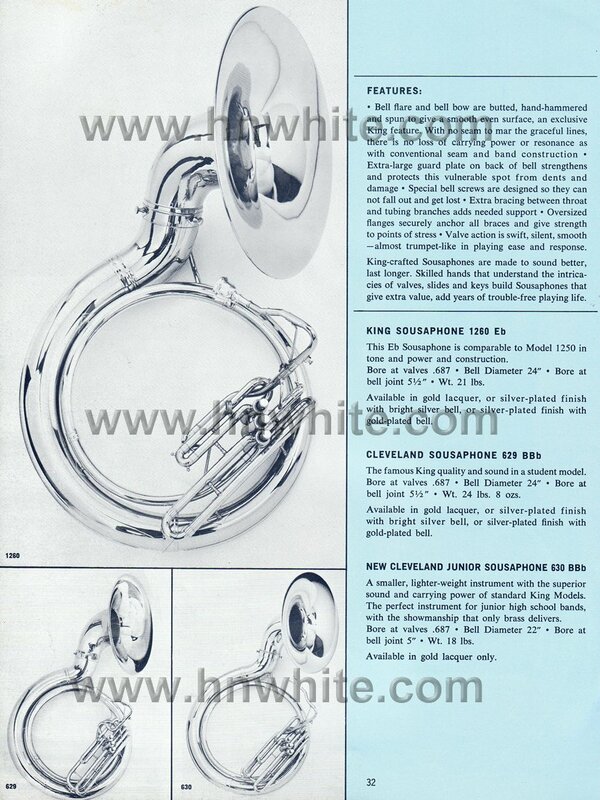 #321...Silver plated, satin finish, barnished bell. 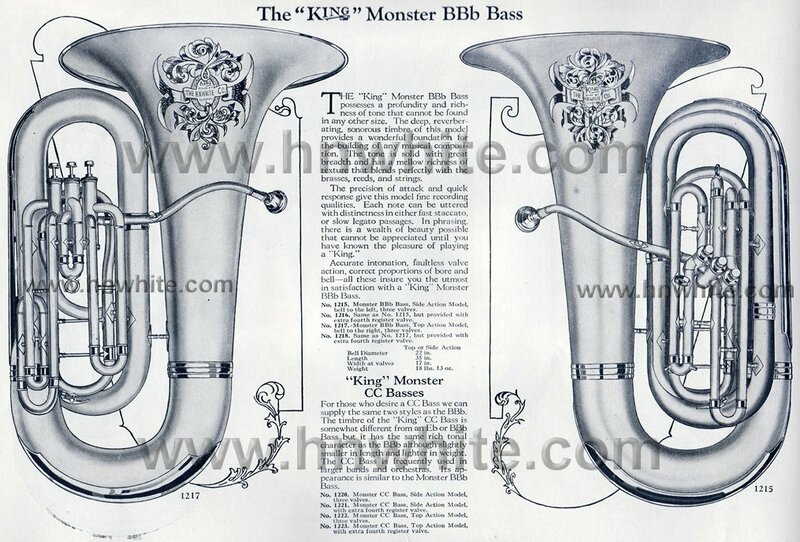 King BBb: #325...Brass highly polished. #326...Silver plated, satin finish, barnished bell. Extra fourth valve available. 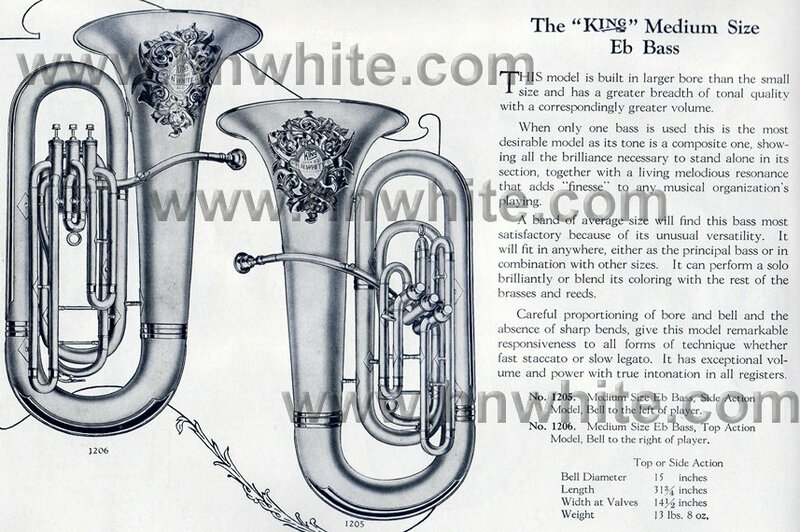 King Eb: #1225...Brass highly polished. #1226...Same as 1225, but with extra fourth register valve. 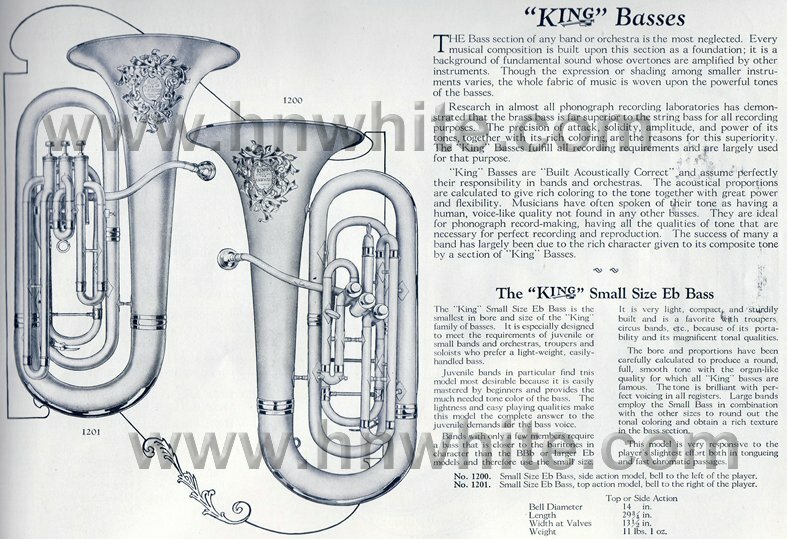 King BBb: #1230...Brass highly polished. #1231...Same as 1230, but with extra fourth register valve. Note: Six finish options available. 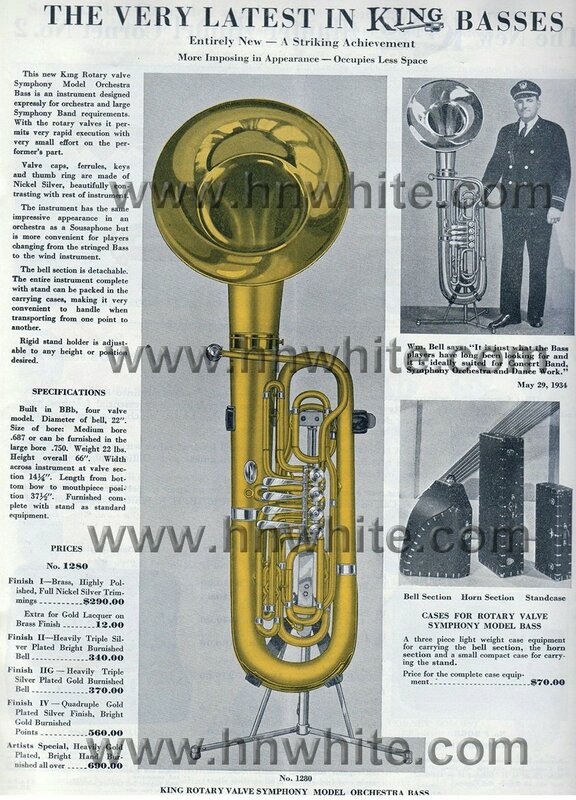 By 1930 the Helicon was already a rare instrument and it is possible that The H. N. White Company did not make any past that year, but just sold out it's inventory. 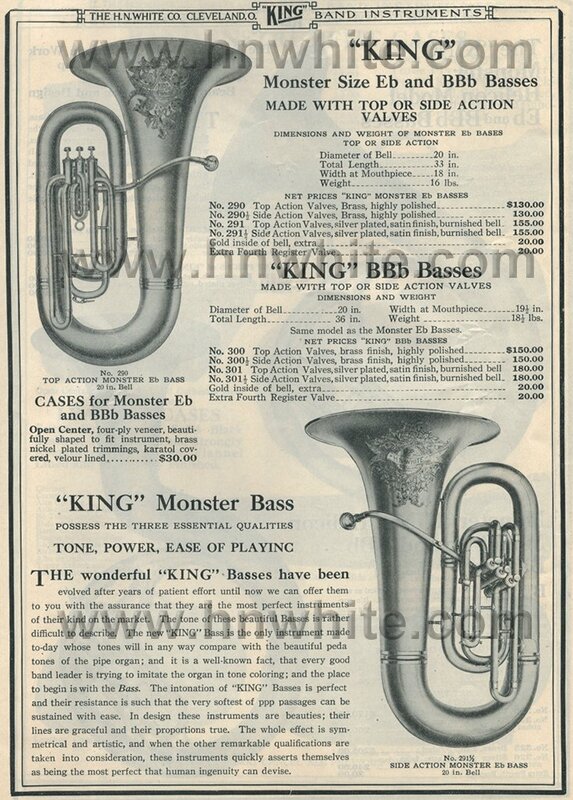 King Bbb #1280...Four rotary valves. Note: Five finish options available. 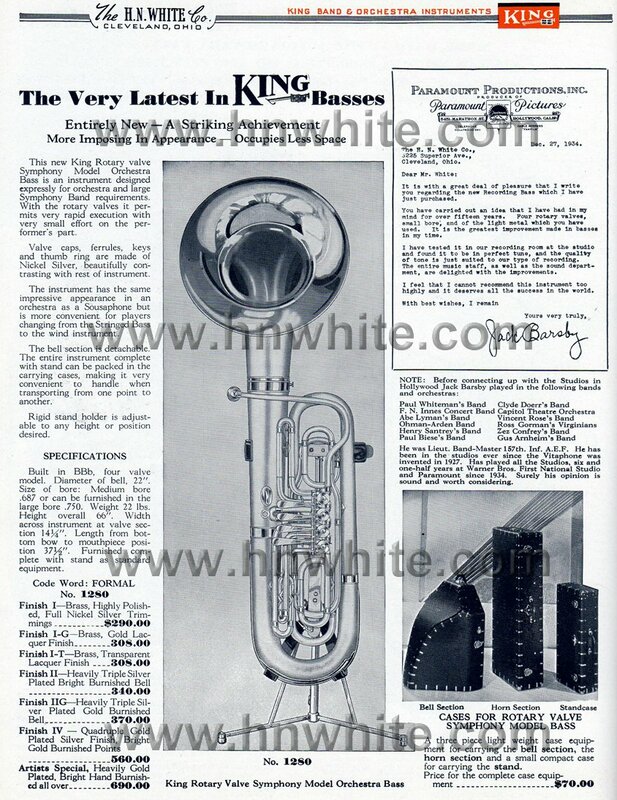 Production of the Rotary Valve Symphony Model Orchestra Bass ended in 1940. #288...Silver plated, satin finish, barnished bell. 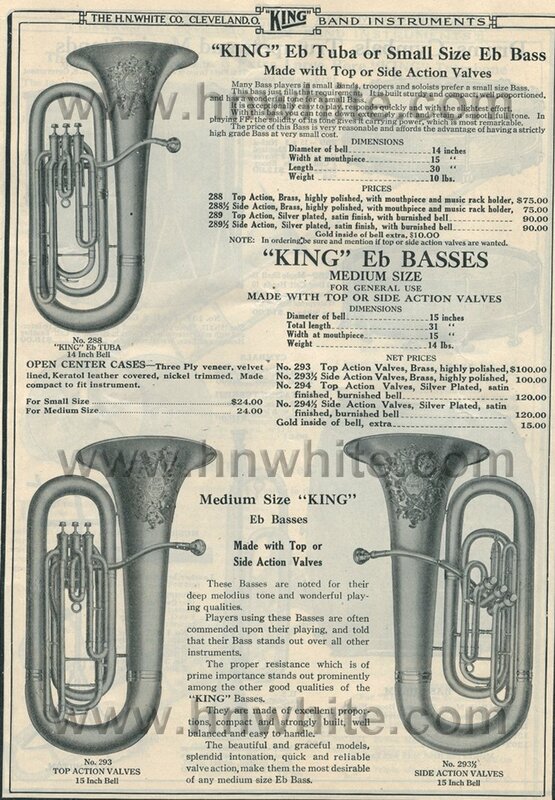 Note: No Small Eb Basses were found in the 1911 Catalog. 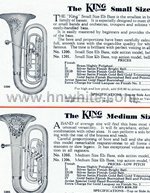 King Small Eb: #288...Top Action Valves, Brass highly polished. #288.5 Side Action Valves, Brass highly polished. 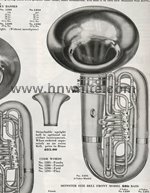 #289...Top Action Valves, Silver plated, satin finish, barnished bell. 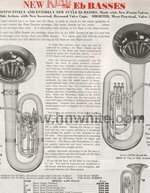 #289.5 Side Action Valves, Silver plated, satin finish, barnished bell. 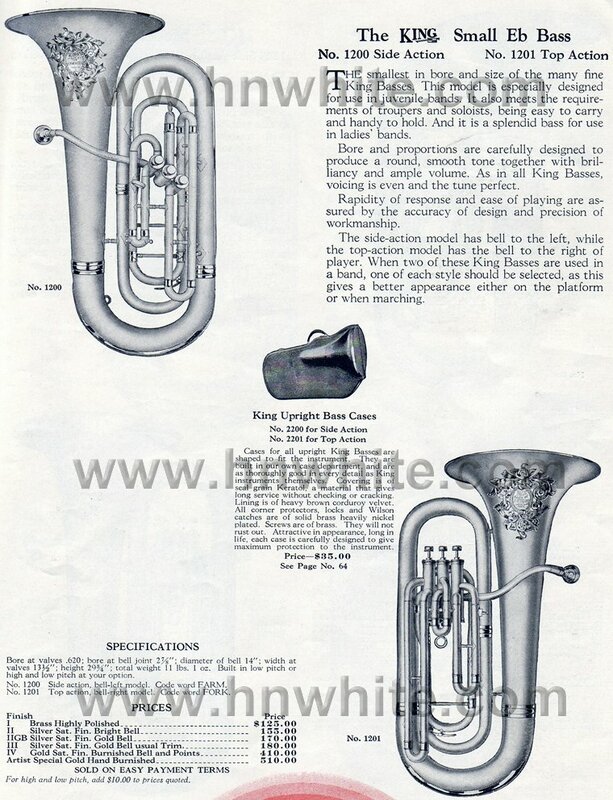 King Medium Eb: #293...Top Action Valves, Brass highly polished. #293.5 Side Action Valves, Brass highly polished. 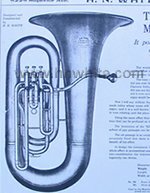 #294...Top Action Valves, Silver plated, satin finish, barnished bell. #294.5 Side Action Valves, Silver plated, satin finish, barnished bell. 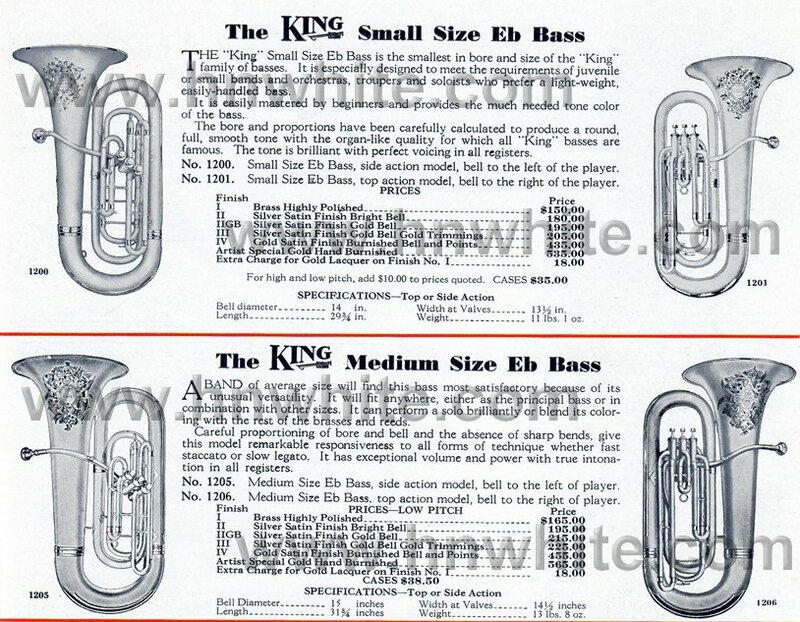 King Small Eb: #1200...Side Action Model, bell to the left, three valves. #1201...Top Action Model, bell to the right, three valves. 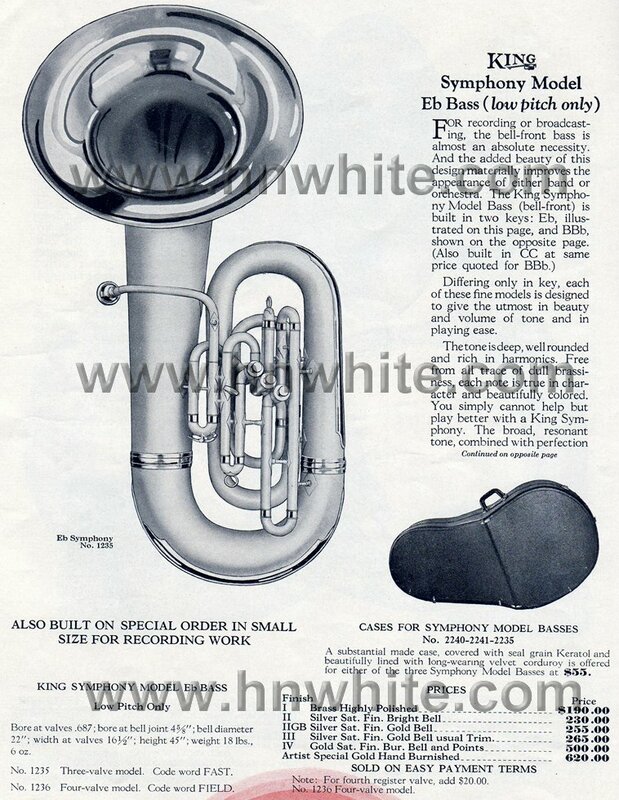 King Medium Eb: #1205...Side Action Model, bell to the left, three valves. #1206...Top Action Model, bell to the right, three valves. 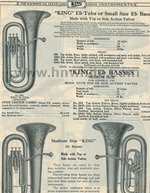 With the start of World War II the King line of Small & Medium basses were retired, never to return again. #291...Silver plated, satin finish, barnished bell. 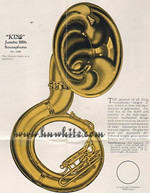 Shown in the 1911 Christmas catalog. 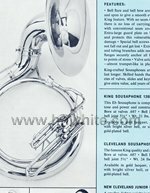 King Eb & BBb: #290...Top Action Valves, Brass highly polished. 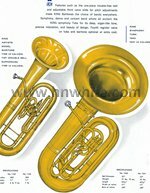 #290.5 Side Action Valves, Brass highly polished. 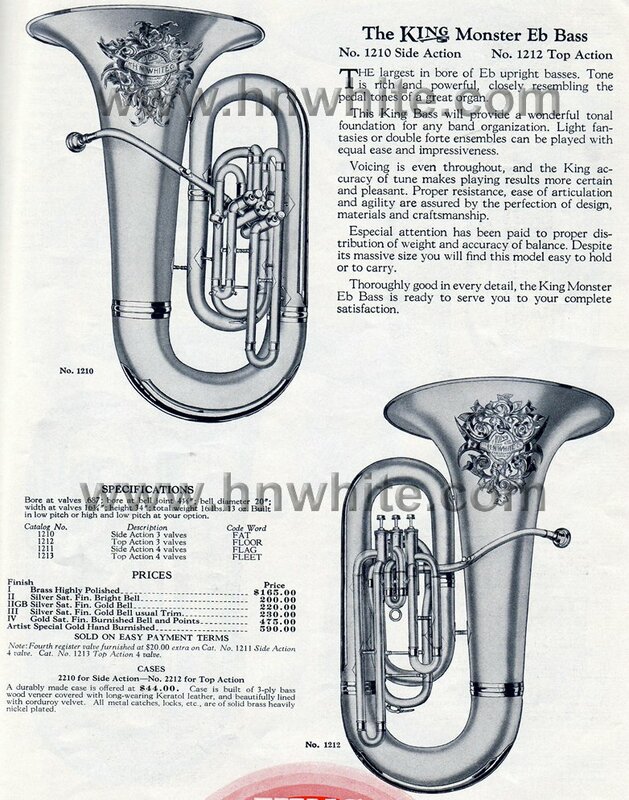 #291...Top Action Valves, Silver plated, satin finish, barnished bell. #291.5 Side Action Valves, Silver plated, satin finish, barnished bell. 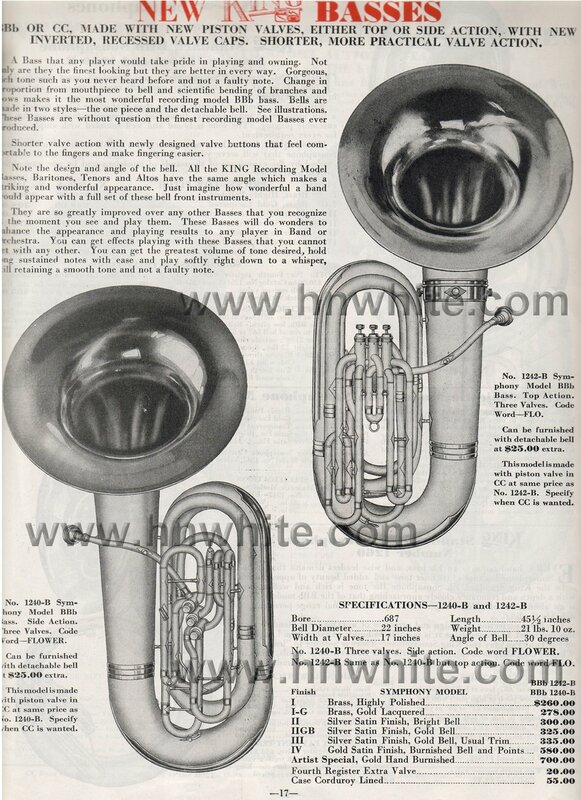 King BBb: #300...Top Action Valves, Brass highly polished. #300.5 Side Action Valves, Brass highly polished. 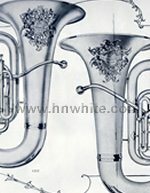 #301...Top Action Valves, Silver plated, satin finish, barnished bell. #301.5 Side Action Valves, Silver plated, satin finish, barnished bell. 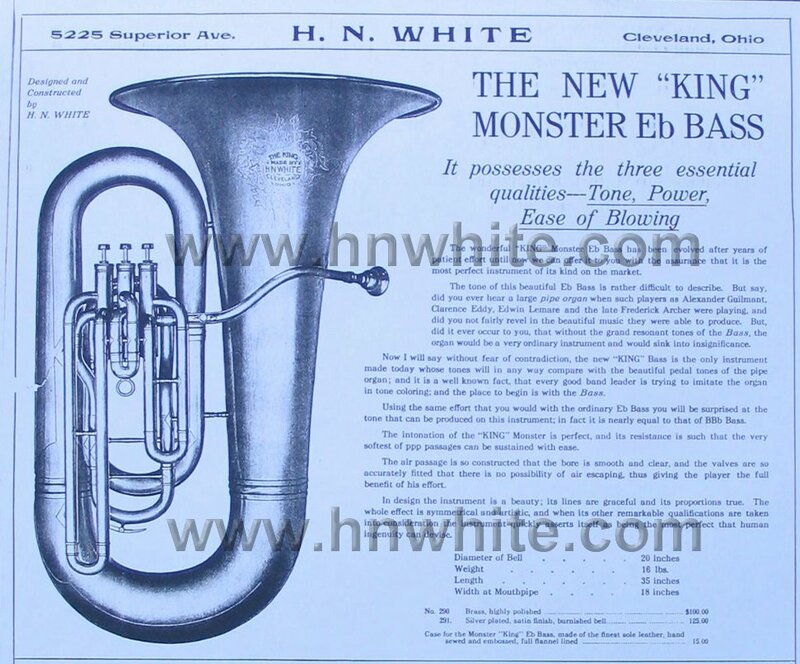 King Eb: #1210...Side Action Model, bell to the left, three valves. #1211...Same as 1210, but with extra fourth register valve. 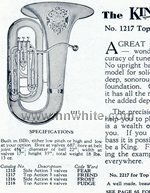 #1212...Top Action Model, bell to the right, three valves. #1213...Same as 1212, but with extra fourth register valve. 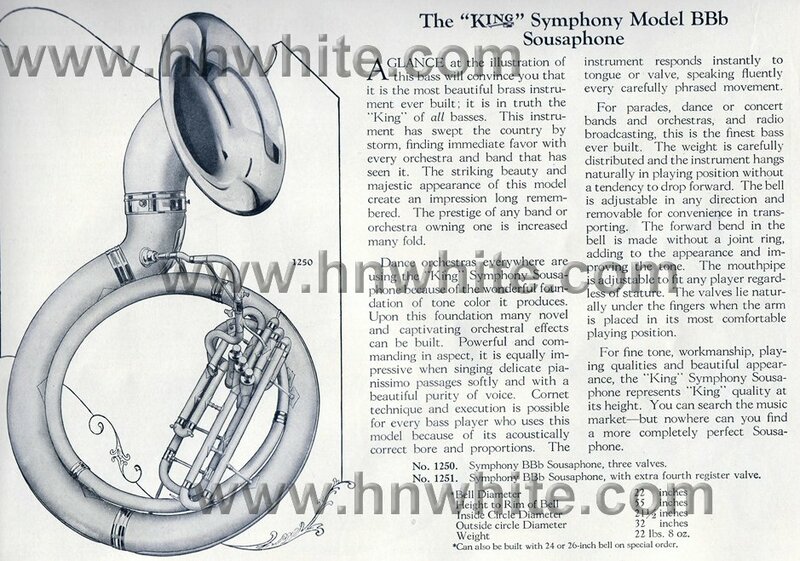 King BBb: #1215...Side Action Model, bell to the left, three valves. #1216...Same as 1215, but with extra fourth register valve. 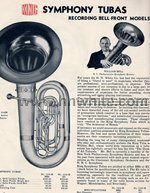 #1217...Top Action Model, bell to the right, three valves. #1218...Same as 1217, but with extra fourth register valve. 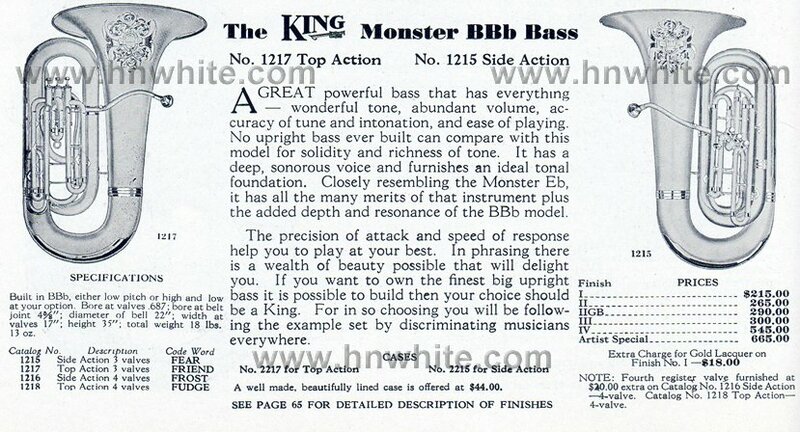 Note: This catalog page includes model numbers and information on the rare King CC Basses but no pictures. 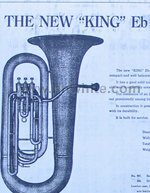 King BBb: #1285...Fixed Bell, three valves. 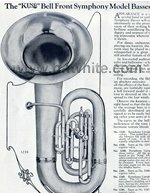 #1286...Fixed Bell, four valves. #1290...Detachable Front Bell, three valves. #1291...Detachable Front Bell, four valves. King CC: #1292...Detachable Front Bell, three valves. #1293...Detachable Front Bell, four valves. Note: Seven finish options available. 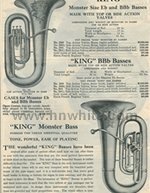 With the start of World War II the King line of Monster basses were retired, never to return again, although there were a few custom orders placed after WWII which would qualify as "Monsters". 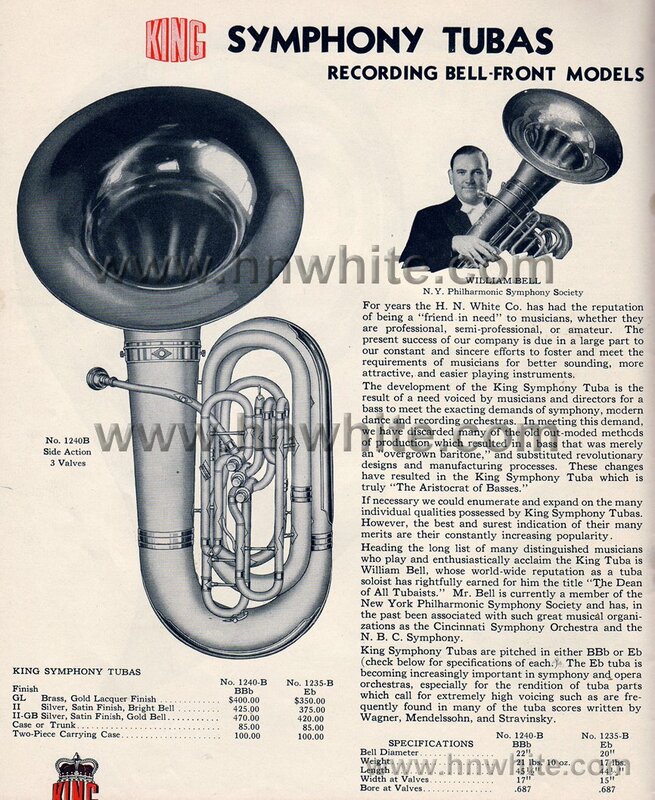 Symphony Eb: #1235...Upright Model, three valves. #1236...Same as 1235, but with extra fourth register valve. 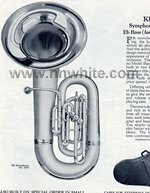 Symphony BBb: #1240...Upright Model, three valves. #1241...Same as 1240, but with extra fourth register valve. Symphony CC: #1245...Upright Model, three valves. #1246...Same as 1245, but with extra fourth register valve. Built in low pitch only. 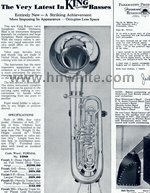 Symphony Eb: #1235...Upright Model, three valves. #1236...Same as 1235, but with extra fourth register valve. 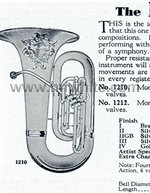 Symphony BBb: #1240...Upright Model, three valves. #1241...Same as 1240, but with extra fourth register valve. Symphony Eb: #1235-B...Medium Size Eb Bass, side action model, bell to the left for player. #1237-B...Medium Size Eb Bass, top action, bell to the right of player. Note: Detachable bell is option and seven finish options were available. 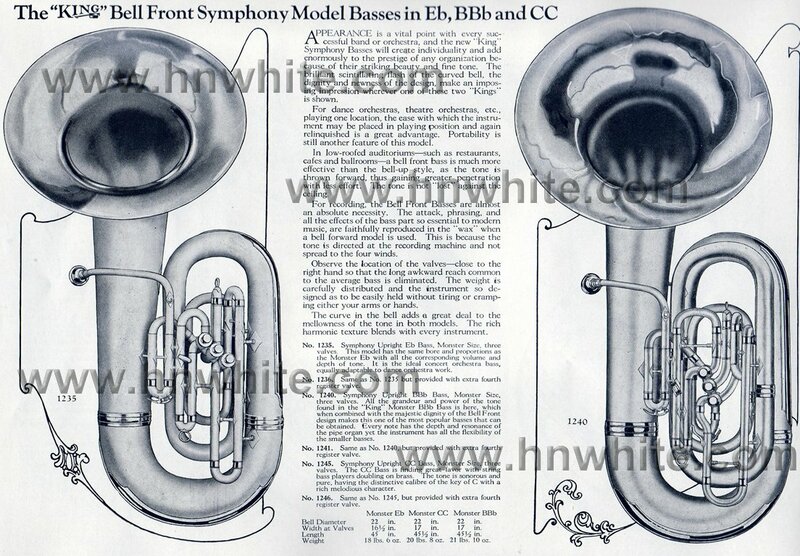 Symphony BBb or CC: #1240-B...Three valves, side action model. #1242-B...Same os 1240, top action. Both can be ordered with extra valve. Symphony BBb: #1240-B...Three valves. Symphony Eb: #1235-B...Same os 1240. Note: Three finish options were available. 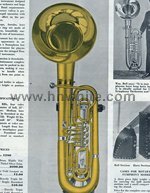 In 1949 the Eb model was dropped from production. Symphony BBb: #1240...Three valves. Symphony BBb: #1241...Four valves. Note: Three finish options were available. 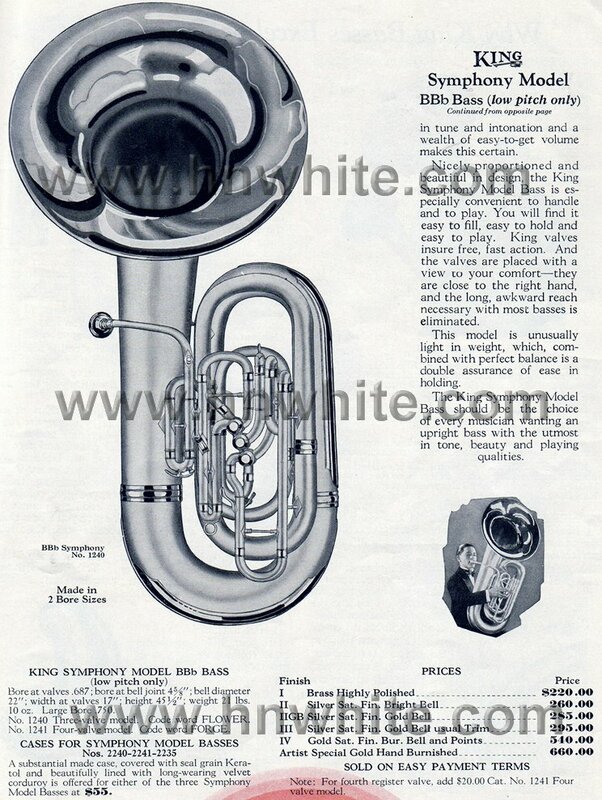 The King Symphony model Tuba remained unchanged until the company was sold in 1965. 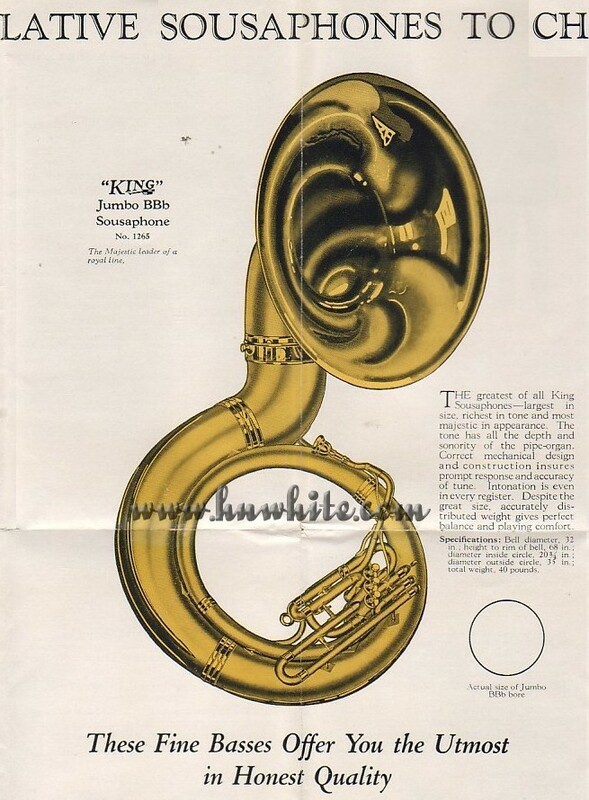 King BBb: #1250...Symphony BBb Sousaphone, three valves. 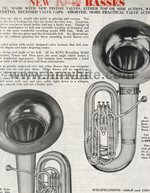 #1251...Symphony BBb Sousaphone, but with extra fourth register valve. 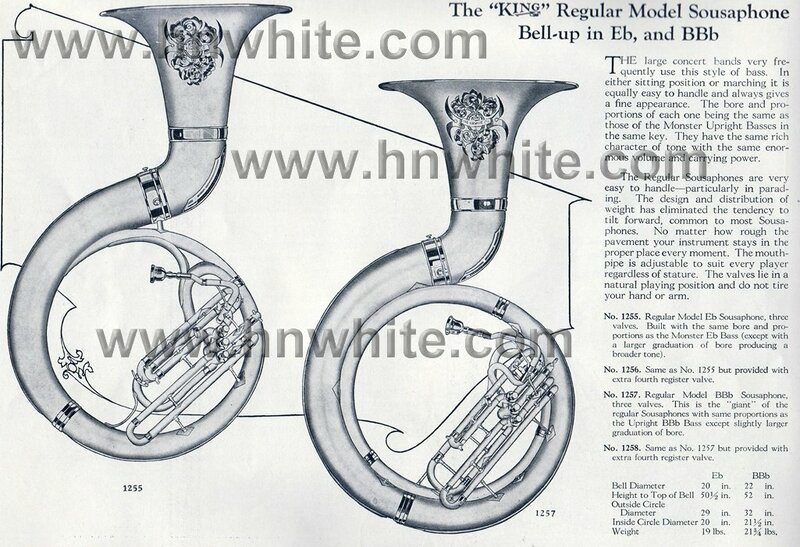 1924 King Regular Eb & BBb Sousaphones "Bell-up"
King Eb: #1255...Regular Eb Model, three valves. #1256...Same as #1255, but with extra fourth register valve. 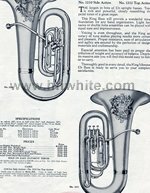 King BBb: #1257...Regular BBb Model, three valves. #1258...Same as #1257, but with extra fourth register valve. 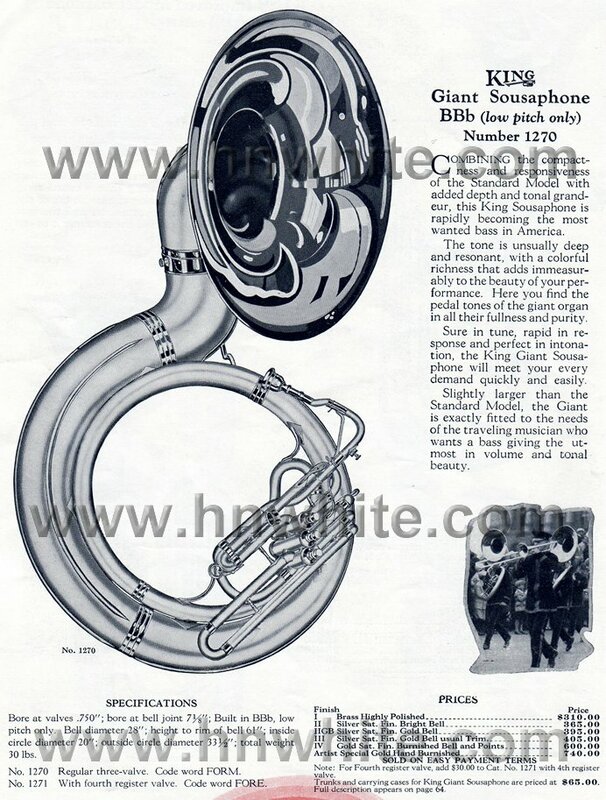 1928 Jumbo BBb Sousaphone Model 1265 was added. Unknown Start of Production and End. 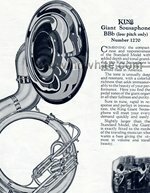 King Giant Sousaphone BBb: #1270...Regular three valve. #1271...Same as 1270, but with extra fourth register valve. 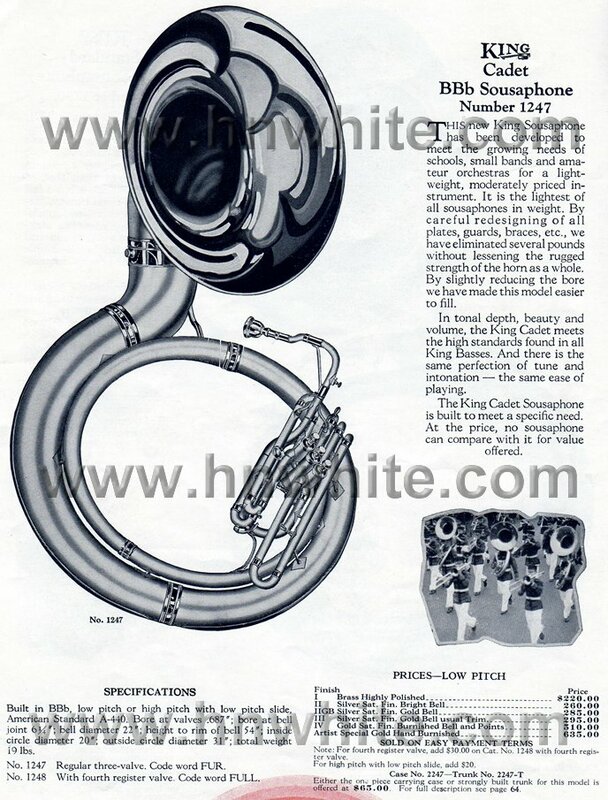 King Cadet Sousaphone: #1247...Regular three valve. #1248...Same as 1247, but with extra fourth register valve. 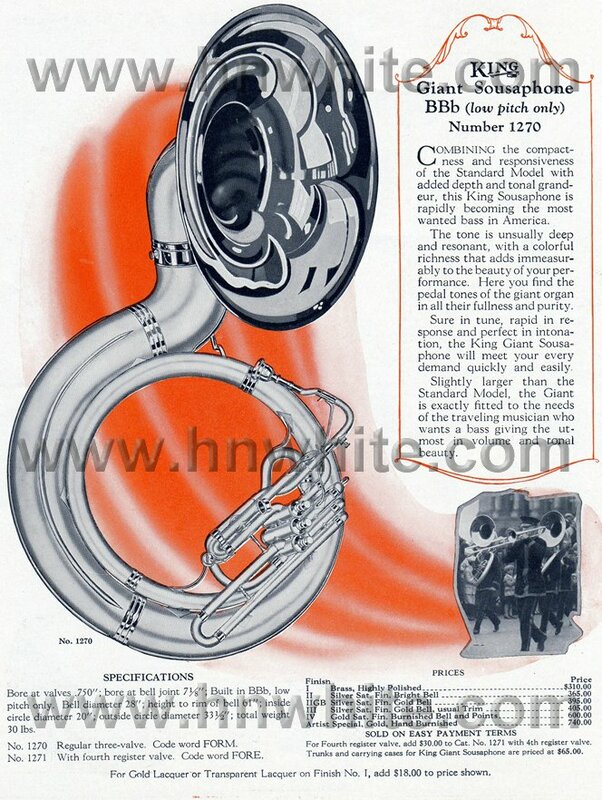 King Standard Sousaphone BBb: #1250...Regular three valve. #1251...Same as #1250, but with extra fourth register valve. 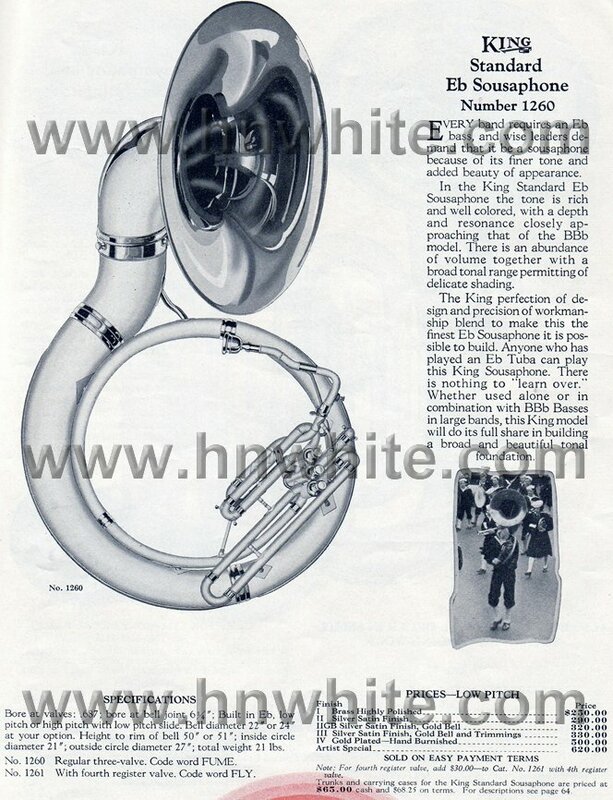 King Standard Sousaphone Eb: #1260...Regular three valve. #1261...Same as #1260, but with extra fourth register valve. 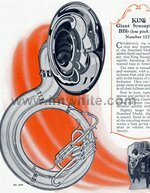 King Giant Sousaphone BBb: #1270...Regular three valve. #1271...Same as 1270, but with extra fourth register valve. 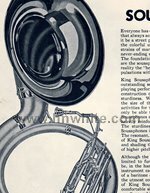 King Standard Sousaphone BBb: #1250-A...Regular three valve. #1250-B...Same as #1250-A, but with extra fourth register valve. 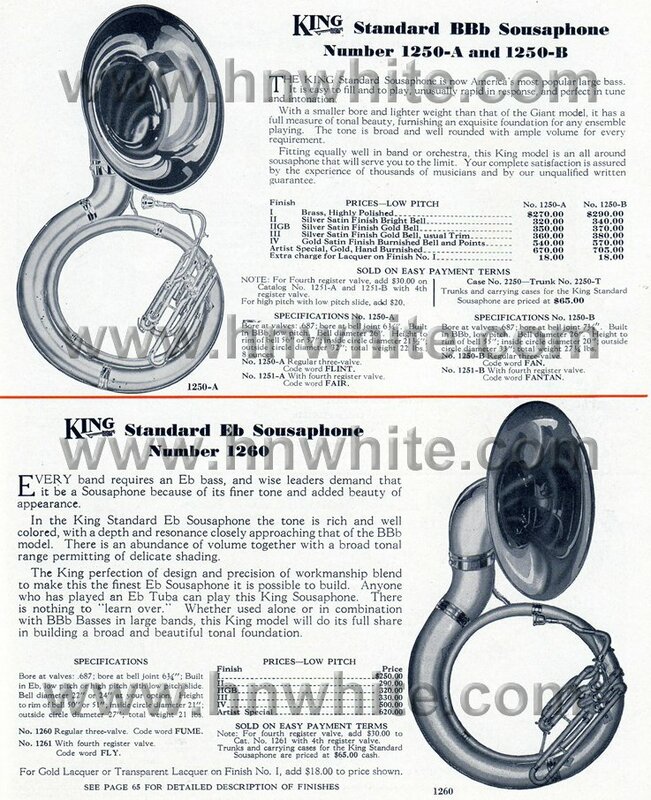 King Standard Sousaphone Eb: #1260...Regular three valve. #1261...Same as #1260, but with extra fourth register valve. 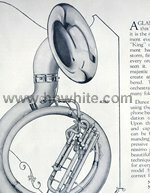 Sousaphone BBb: #1250-A...Three valves. 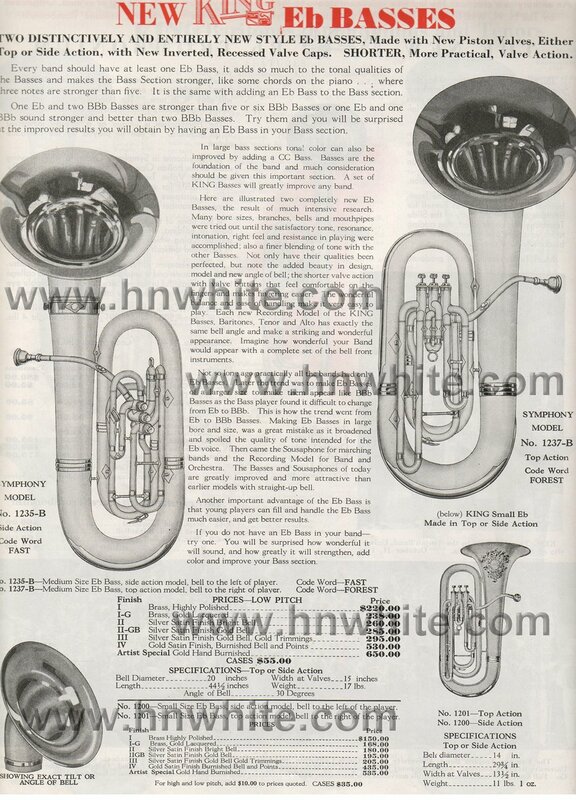 Sousaphone Eb: #1260...Three valves. 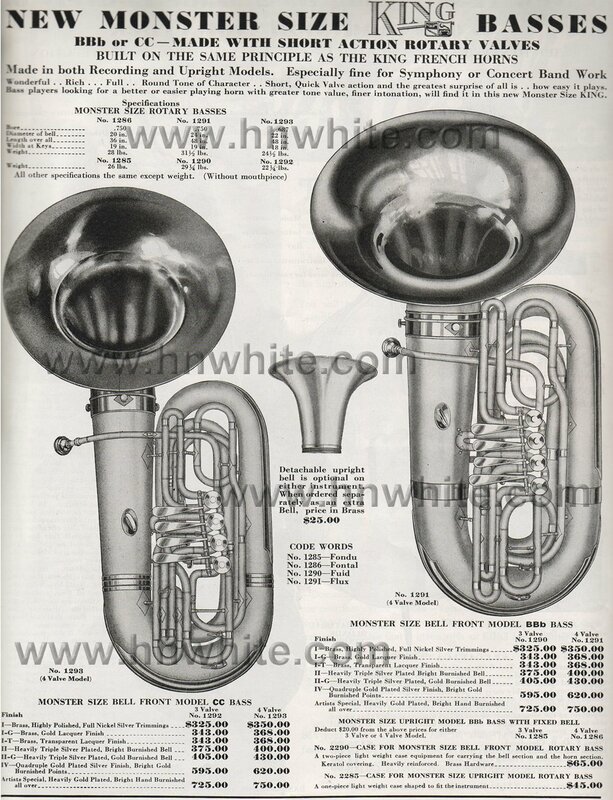 Sousaphone BBb: #1250...Three valves. 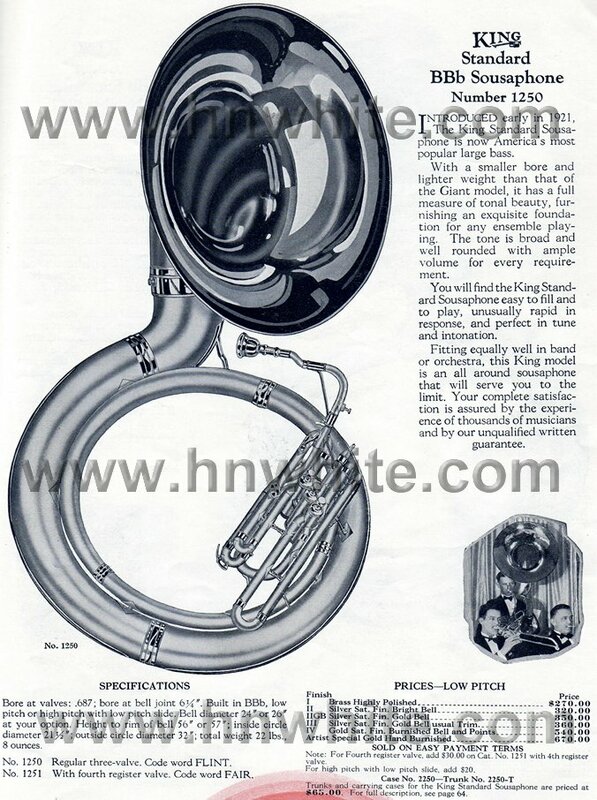 Sousaphone Eb: #1260...Three valves. 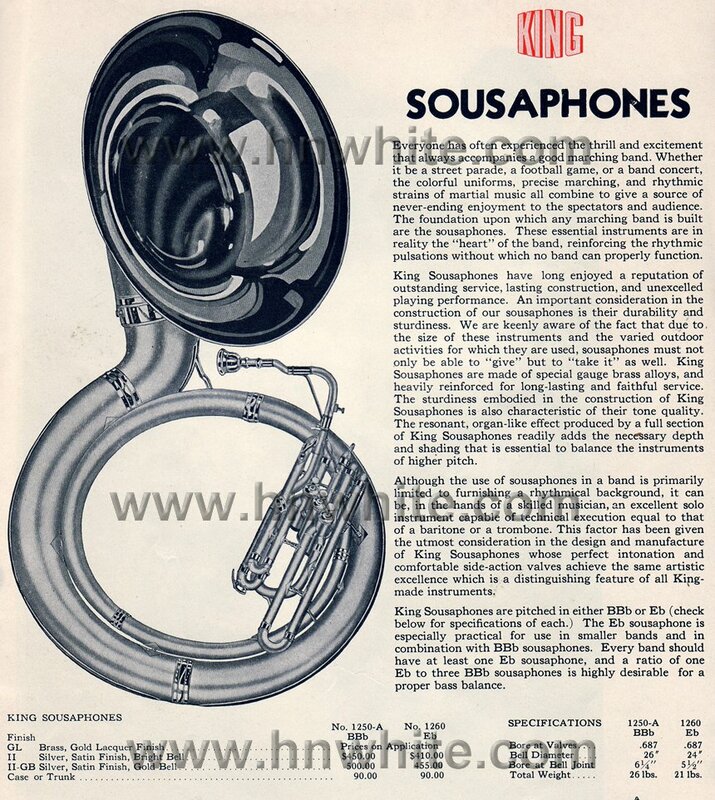 The King BBb and Eb Sousaphones remained unchanged until the company was sold in 1965. All the information on this page is compiled by guess work and should be used accordingly. 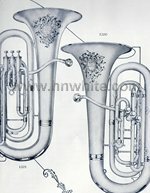 All pictures and written material are property of www.hnwhite.com and may not be reproduced without written consent. All rights reserved. 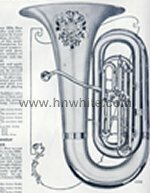 Attention www.ebay.com sellers: you may now use the watermarked catalog pictures in your auctions. Please provide a link to this website.